As we have been writing ad nauseam lately, the Obama Administration is now out of the shadows with its plan to “seed” towns and cities across America with diversity. ‘Seed’ is their word! Your community is the soil into which the migrants of all sorts (legal and illegal) are being planted according to Obama’s Task Force on New Americans. It begs the questions: Are we being colonized? Do they plan to replace us some day? Sound far-fetched? Knowing Obama, are you willing to gamble on that? 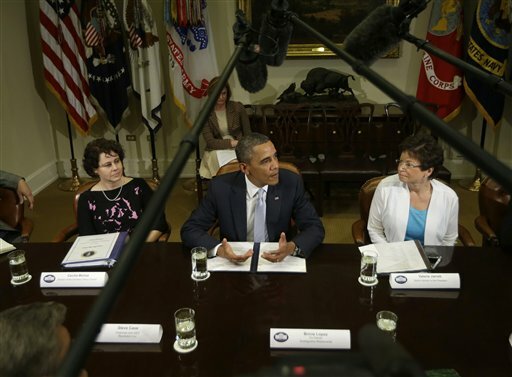 President Barack Obama, flanked by Cecilia Muñoz, director of the White House Domestic Policy Council, left, and senior White House adviser Valerie Jarrett are changing the people by ‘planting’ immigrant “seedlings” in towns across America! We have long maintained a ‘fact sheet’ about how the UN/US State Department’s Refugee Admissions and Resettlement Program works, click here to learn more. FACEBOOK UN-AMERICAN AND AGAINST FREEDOM OF SPEECH AND EXPRESSION. FB IN FAVOR OF ISLAM AND ITS BARBARITY AND SAVAGERY PER THE KORAN! FACEBOOK BANS WORLD WAR II BIOGRAPHER P.A.SPAYD for stating fact that “Muhammed was a bloodthirsty warlord.” Banned for “VIOLATING COMMUNITY STANDARDS!! Oh, is this like stating “Hitler was a bloodthirsty dictator & genocidal maniac.” Not banned. History is history folks! It is a fact that Muhammed and his ‘followers of the prophet of islam’ did kill 800 Jewish men and boys at Khaybar! Enslaved and raped the women and girls and sold them into slavery. Oh, can’t recall HISTORICAL FACTS! BANNED!! Learning from the Past – specifically from Herr Manfred Rommel about ‘not disturbing the peace of the German people’ as enacted by the Third Reich. Mr. Rommel told me that to violate this law got you punished by a visit by the Gestapo in the middle of the night, hauled off to a prison cell to sit the night and think of your transgressions and the punishments in store for yourself and your family. So, being banned by FACEBOOK for stating that “Muhammed was a bloodthirsty warload” isn’t such a bad punishment in the pain spectrum. If FACEBOOK wants to hire muslims to screen its patrons, well, I can go elsewhere and practice true American Freedom of Speech and Expression. “OFFENDING” the mythical religion of peace, is something to actually take pride in, considering since September 11th 2001, there have been over 31,000 muslims attacking people worldwide. Think about that and wonder how they become their own victims if someone actually FROWNS at a musleema sporting a nijab, rather than getting beaten by the muslim countries Religious Police. This is so much fun – lets enact Nijab wearing worldwide! You too can have religious police beat the crap out of women who are so brazen NOT to wear that crappy old rag on their heads. As for me and my house? We’ll wear a hat, weather permitting, and if its a sunny day? Enjoy the wind blow thru your hair! Facebook can go pound sand. hmmm, which is a good metaphor. Free Speech and BANNED by Facebook!